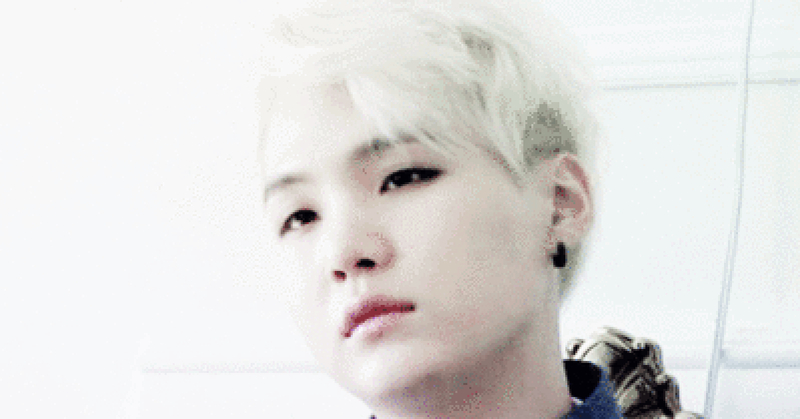 A Japanese news article that has accused BTS's historical convictions for being anti-Japanese has brought controversy. Last week on the 26th Japan's Tokyo Sports published an article titled "BTS's Insensitive A-Bomb T-Shirt, Leader's Anti-Japanese Tweet." This article disclosed that "BTS is actively participating in the anti-Japanese movement," and provided RM's 2013 tweet, posted on August 15th, Korean's National Independence Day, as evidence. At that time RM had written, "A nation that has forgotten her past has no future. I hope we can take the time today to commemorate those who fought for our independence and sacrificed their lives for our country," with the desire to remember the true meaning of National Independence Day. However, the Japanese media identified the statement "a nation that has forgotten her past" as a phrase used frequently in Korea to criticize Japan. This particular media also problematized the T-shirt worn by BTS member, Jimin. The shirt displayed both a photograph of the Hiroshima bombing incident and a photograph of Korean's National Independence Day. Concerning this, the Japanese media in question explained that "the T-shirt had printed an image of Korean citizens overjoyed at regaining its country along with the incident of the atomic bombing in Hiroshima." 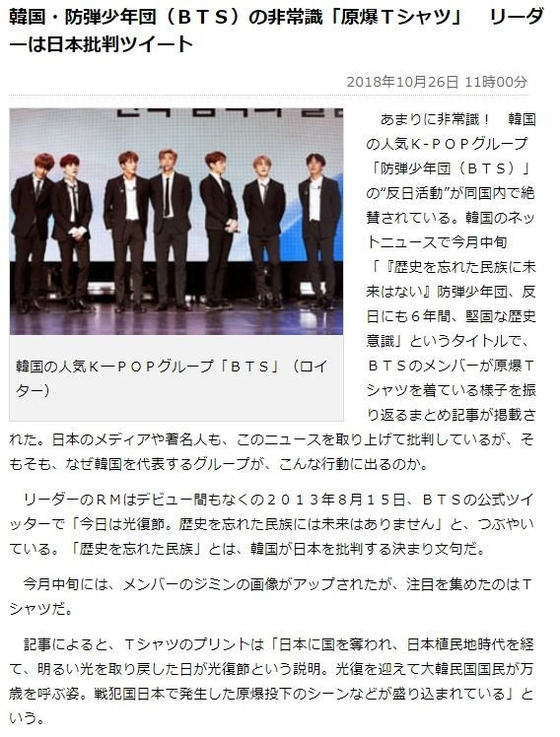 The Japanese media also criticized BTS, stating that "a group that is also growing in popularity in Japan did not care to hide its anti-Japanese position." In addition, a reporter of this particular media is said to have commented that "Korea is a country that has historically sought to be sympathized. The group that represents Korea provokes Japan through an image printed on a T-shirt. This indicates a deeply-seated inferiority complex contained within the history of his own nation." 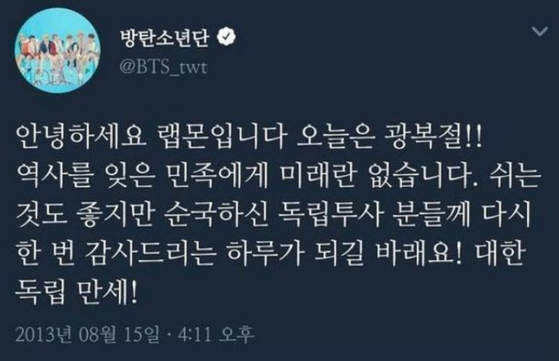 Meanwhile, after BTS cancelled its agreement at the protest of its fans to collaborate on the song "Bird" with the Japanese artist, Akamoto Yasishi, who has caused controversy over misogynistic and rightist claims. this issue gained much attention. Antagonistic sentiments from within the country increased further after it was reported that AKB48, a Japanese girl group produced by Yasishi performed in front of an Yasukuni shrine dressed in the Japanese national icon of the red rising sun.